California is hardly moving into fall any time soon, but it’s nice to own pieces such as this dress that can benefit from layers and accessories added, giving it an immediate spot in an overly-hot-fall clothing rotation. This dress is one of my all time favorites, and it’s extremely comfortable. It pairs well with hats, scarves, jackets, vests, heels, and sandals, making it extremely versatile. The little cutout shows just the right amount of skin without being too much for everyday wear. I wear this dress casually, and I also dress it up a bit on occasion, and judging by my last post (you know, like 2 months ago) I obviously love pieces that are flexible and transitional from day to night when working in the fast-paced production industry. I live in Culver City and work in Glendale, which is like EIGHTEEN MILES apart. **Gasp**, what a tragedy! Well, I’m right there eye-rolling with you, but that can feel like an eternity in LA when it usually requires taking 4 freeways to work. I have Midwest friends who regularly commute from Lincoln to Omaha for work (60 miles or so) and probably make it to work faster than I do, which is why a metro commute, in my opinion, is a good thing. It has actually taught me the artful skill of PLANNING MY DAY. I plan ahead on what I wear, what I bring with me, when I can stop at the gym and when I can run my errands. When I lived in the Midwest this was not a functioning part of my brain, ask anyone who knew me, mainly because it didn’t have to be. I always had time to go home and change, or stop and run random errands without thinking about it, so having a few outfits on hand that are functional, transitional, and COMFORTABLE are absolutely key. I stepped into the pre-fall vibe a bit by adding this hat, but not much more accessorizing than that was doable on a 100 degree day in Glendale. I’m equally obsessed with this dress and hat for fall, so get ready to see them paired with pretty much everything in the coming weeks! Am I the only one who most of the time finds pants somewhat uncomfortable? I mean, I know I usually wear ‘em pretty tight, but even my softest, stretchiest, and most comfortable pairs don’t compare to a good jersey maxi skirt. I’ll be honest, for as much as I like getting dressed in the morning, I equally like getting undressed when I’m home for the day. I think maybe I just have this weird thing about needing to change clothes. I’m perfectly comfortable in most of what I wear, but I will take the first opportunity I get to put on sweats or yoga pants the second I get home if I’m done for the night! Well, the exception to this little habit may just be this skirt. It’s awesome, made of the softest jersey, and it’s literally like wearing PJs. Being that it’s nice and high-waisted, means I can toss on a loose and sheer crop top without over doing it on the “skin” factor in relation to that side slit with the skirt. 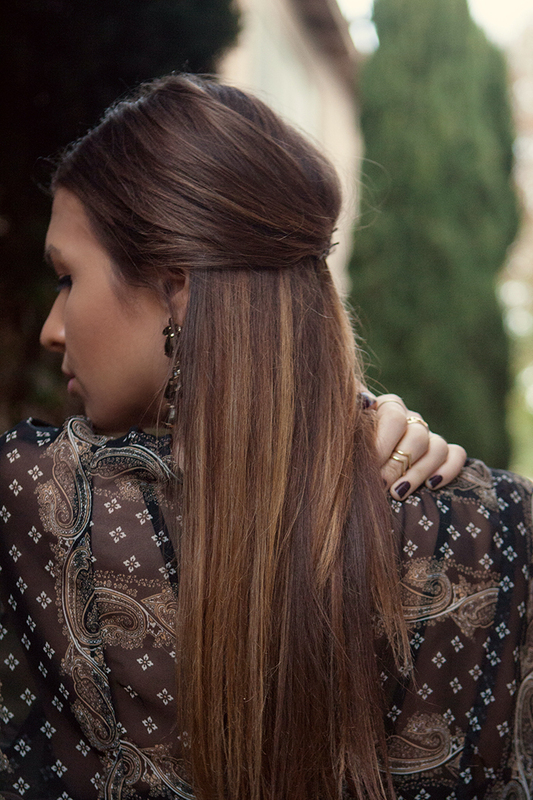 Throw on some fun accessories, and it makes for a nice all-black gypsy look with a touch of comfort.